I have never seen one of these before. 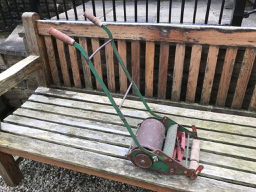 I intend to restore the little mower as it is rather cute ! 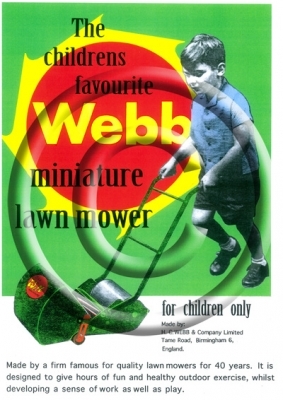 Sounds like a Webb Miniature, originally produced in 1957 & appeared at the British Industries Fair in Birmingham that year, production continued into the early 1960's, early models had wooden hand grips then later plastic. They do crop up quite regularly we have a fleet of 10 we use at displays etc to entertain the children & races! We do disconnect the cutting cylinder! Also occasionally brand new boxed ones turn up that have been hidden away in lofts etc since the 1950/60's. The original launch info stated that the rubber band drive was to help safety in that the band would slip if anything got caught in the blades, also the blades would stop spinning instantly when the main roller stopped due to the friction. Thank you for the quick and very informative reply. I love the brochure / poster amazing any chance of a high res scan of the middle picture I would love to show it to the lady that gave me the machine. I am struggling to get photos onto the site they appeared to upload but have disappeared ! The little mower I have is the same model but unfortunately has lost it's grass box and belt cover. Otherwise it is complete. 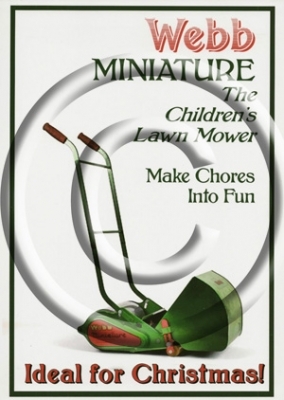 I will attempt to upload my photos again of the little mower. That's quite a well built and substantial toy. What did they sell for back in the day? In March 1957 they were advertised for 77/6, that's £3 17s 6d or for the youngsters out there equivalent to £3.87 or perhaps the cost of a pint of beer nowadays!! They were advertised for 3 to 6 year olds. Well done John in getting photo's on, have emailed you direct re poster. At today's value that works out at about £85 ! Not exactly a cheap toy ! Indeed today you could almost buy a full sized machine with an engine for that. Ah but it would not be made in England or last 60 years. A former customer of mine had one that he acquired in the late 50s when buying a new full sized Webb. It had been “used” by his children and lent out to grandchildren etc and in the 90s was hanging up in his garage, complete and in good “ played with” condition. I am told that it is still with the family. I have 2,, both later ones with rubber handles, ones really nice in "as new" condition in my mower garage and one which I'm currently restoring along side a Witch for me and my son to have a little Kodak moment.. These little Webb miniatures are lovely and I'd buy another one in a heartbeat. 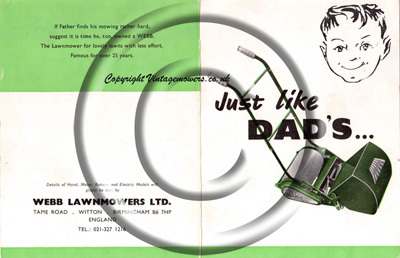 Thanks for sharing Lee; he will remember that mower as he grows up and hopefully pass that onto his children to use. I must get one myself if I can find one. I last saw one at Bridport market a few years ago. 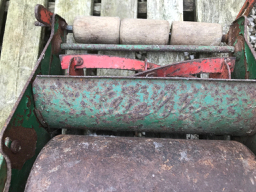 I am making good progress with restoration of the little mower but would like some advise on the type of drive belt used in the original. It appears you can get polyurethane belts made in any size but I imagine the original would be rubber or one of those strange metal belts that were used with Mamod steam engine models, more flexible ? I am also looking for a pulley cover which is missing from mine - the grassbox is also missing but I reckon I could make one ! As yours has the plastic handles, I'd imagine the drive belt would be the same as the rubber one on Toby's. 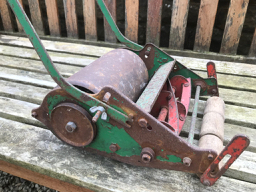 Looks like your missing the cutting cylinder pulley as well as the belt, there is a couple of these mowers being sold on eBay and Facebook but asking a lot of money. Probably worth it if next door but not if you got to drive 6 hours to get em. Maybe placing a wanted as on this website may come up with something, the auction at the mk museum in may might unearth one too. I'LL post here if I come across one. I can add detailed photos of belt if you need me too.